A great tasting bread (cake) for breakfast or for a snack during the day. Preheat oven to 350 degrees F. Grease two (2) 8-inch x 1 1/2-inch round cake pans. Sprinkle yeast and 1/2 tsp. of the sugar over very warm water in a 1 cup measure. Stir to dissolve yeast. Let stand until bubbly, about 10 minutes. Combine 2 cups of the flour, salt, lemon rind and the remaining sugar in a large bowl; make a well in the middle. Beat eggs and egg yolks in a small bowl just to mix. Pour eggs, yeast mixture and warm milk into well. Stir liquids into flour until smooth. Beat well. Add softened butter gradually, beating well. Stir in 1 more cup of the flour. Beat until dough leaves the side of the bowl. Knead on a lightly floured surface; until smooth and elastic, about 8 minutes. Press dough into a buttered large bowl, turn to bring buttered side up; cover. Let rise in a warm place, 1 1/2 to 2 hours, or until doubled in volume. Beat cream cheese and cottage cheese in a small bowl with an electric mixer until smooth; beat in egg yolk and sugar. Stir in lemon rind. When dough has doubled, punch down, knead in raisins; divide dough into four equal parts; press two parts into the bottoms and about 1/2 inch up the sides of the prepared pans; spread each with about 1 cup of the cheese filling. Shape remaining dough into 2 8-inch circles; place on top of cheese filling. Press the handle of a spoon into dough around edges to seal. Combine nuts, flour, butter, sugar and cinnamon in a small bowl. Sprinkle the crumb topping over both 8 inch dough circles. Let rise in a warm place until dough reaches the top of the pans, about 1 hour. Bake babka's in prepared pans in preheated 350 degree F oven for 40 minutes; or until the cakes sound hollow when tapped. Cool on a wire rack. Place foil loosely over the crumb topping. Invert babka's onto racks, then turn right side up. Let cool at least 30 minutes before serving. Sprinkle with powdered sugar. Makes two (2) 8-inch Babka's, about 8 servings per babka. 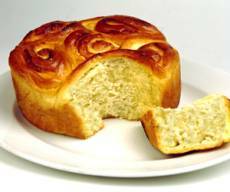 I like this recipe, as I am looking for the classic New York Cheese Babka from Brooklyn or Manhattan. I roll the dough into a rectagle and fill it with the cheese mixture. Roll it back into a long roll and put it into an tube pan. The cheese distributes better. Dough did not quite expand to top of pan during second rise, but otherwise came out great. I think a little more yeast is required next time I bake babka. I also rolled into a rectangle and i put in cheese filling and pistachios, but i missed the egg yolks, ups!! Great taste but definitely needs a bit more yeast. Came out fairly flat but I will make it again.